The best washer-dryers deliver clean clothes that come out of the machine beautifully dry and will see you through load after load for years to come. But our tests often find that washer-dryers combos don't do a good job of both washing and drying. Compare the latest models in our washer-dryer reviews. Are washer-dryer combos any good? How much does a washer-dryer cost? How wide is a washer dryer? What size drum should I look for? What spin speed do I need? Which washer-dryer brand won't breakdown? Which washer-dryers use the least water? Which brands do black or silver washer-dryers? 1. Pick one brilliant at both washing and drying. We've independently lab tested hundreds of washer-dryers over the years. Our tests show that many machines are brilliant at washing - but only just OK at drying. Find one that excels at both key jobs using our Best washer-dryer recommendations. With two machines-in-one, there’s more that can go wrong with a washer-dryer compared to a washing machine or tumble dryer. 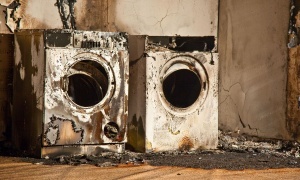 There's a big difference between the most and least reliable washer dryer brands. 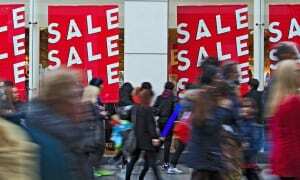 In fact, the least reliable brand based on the results from a Which? member survey scored 30% less than the most reliable brand - resulting in a meagre two star reliability rating compared to four stars for the latter. Washer dryers have two drum sizes: one for washing and one for drying. This means that for almost every model the drying capacity is at least 2kg smaller than the washing capacity. Get the right size for your needs using our guide to washer-dryer drum size. A good spin cycle will remove more water before the drying phase kicks in. But a higher spin speed doesn’t always mean dryer clothes. Jump to washer-dryer spin speeds to find out more. Washer-dryer running costs vary from around £60 per year right up to more than £150. Use our washer-dryers lifetime-costs calculator to find out how much your machine will cost you to run over its lifetime, including the purchase price and energy costs. And use our interactive widget below to help you with what you need to know before you buy a washer-dryer. In general, it can be hard to find a washer dryer that does both of its jobs really well. Some machines clean clothes and remove stains perfectly but struggle to dry the load after. While other models dry your garments thoroughly without damaging fabrics or overheating, but find removing dirt residue tricky. These are things that you cannot check on the shop floor; so be sure to always read our full reviews before buying a model to avoid ending up with a dud. At the time of writing, around one quarter of the washer-dryers we've tested that are still on sale are Best Buys, so you won’t be short for good choice as long as you do your research. Space saving - Being able to combine two machines into one is probably the best thing about a washer dryer. This means they are perfect for those of you that are short on space, don’t have a garden to hang out washing or just simply don’t want too many large appliances in your home. Upfront cost - If you’ve just moved house and you need new appliances or if your washing machine and tumble dryer have conveniently packed up at the same time, opting for a washer dryer means you save money buying one machine instead of two. Running cost - Like most standard washing machines the wash cycle is generally efficient and economical in a washer dryer. However, the dry cycle typically uses more energy than traditional condenser or vented tumble dryers. Drum size - The wash and dry drum capacity is different in every machine. This means that if you fill the wash cycle to its capacity, you will have to remove some garments before the dry cycle. If you tend to wash as much as you can in one load this could cause hassle. Lack of choice - Naturally there will be less choice for a washer dryers, compared to traditional washing machines and tumble dryers because there is less demand for them. So if you’re looking for a different colour or specific features finding the perfect product might be a little more difficult. While cheaper models are always tempting, our tests show it's worth stretching your budget to around £500 for a great model that washes and dries well. This might sound a lot, but remember you’ll be getting two machines in one. 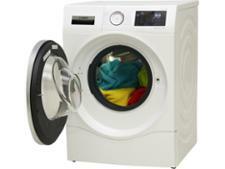 A typical washer-dryer that washes 8kg and dries 5kg will cost you about £126 per year. That’s £37 on the washing and £89 on the drying. Most of the energy used by a washer-dryer will be sucked up during drying. Like standard washing machines, washer-dryers are generally an affordable and efficient appliance to use when on a wash cycle. However, the dryer pushes the costs up and tends to be less frugal than standard vented and condenser tumble dryers. We'll give you the usage cost in each of our reviews, so you can compare the most and least expensive models. This is the most recognisable type of washer-dryer, designed to slot into standard appliance spaces in kitchens. Height and width are always similar, but depth can vary. The front of the machine will be visible. It doesn’t live behind a cabinet door, so won’t be hidden away like an integrated (or built-in) machine would be. Drum capacities are comparable with a standard-sized washing machine with 8kg washing and 5kg drying about average. The front of an integrated (or built-in) washer-dryer is covered with a kitchen door panel when it's installed. Integrated washer-dryers are best if you are looking to blend your appliance into your built-in kitchen. Integrated models tend to be slightly quieter to run than freestanding models. However, the typical installation cost for an integrated model is £80. That’s more than twice as expensive compared with installing freestanding models – and some retailers won’t install them at all. An integrated washer-dryer costs about twice as much to install as a freestanding one. Drum capacities tend to be smaller than freestanding washer-dryers, mainly due to the fact that they’re not as deep as freestanding machines. 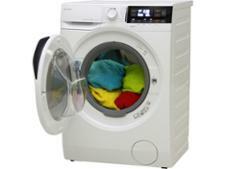 You’ll find a 7kg washing and 5kg drying capacity on many machines. Most washer-dryers are between 595 and 600mm wide. 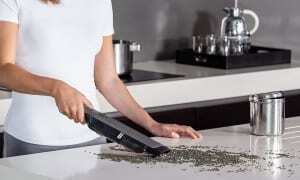 They are designed to fit into a space 600mm wide. The standard height of a front-loading washing dryer is 850mm high. But there can be exceptions, so check the specifications before choosing a model. Depth can differ though – ranging from around 40cm to 70cm. Avoid having your machine sticking out into the walkway of your kitchen by checking the specs of a model against the space you have in your home before you buy it. Washer-dryers always have two drum capacities - one for washing and one for drying. They can always wash a larger load than they can dry. Base your buying decision on how often you wash your clothes and the amount of garments you like to wash in one go. If you have lots of clothes but you only like to do two loads a week, a larger drum size will suit. The amount a washer-dryer can clean in one go typically starts as little as 5kg (which is enough to wash 16 men's cotton shirts at once) and ranges up to 12kg, enough to wash 38 shirts at once. An 8kg washing drum capacity is about average. The drying capacity is always smaller than the machine's wash capacity, typically ranging from 2.5kg to 8kg. That means that if you've filled the drum when washing, you’ll need to take a few items out before drying. The more you need to take out, the more of a pain the machine might be to live with. The weights given are dry, rather than wet weights. The sliding graphic below shows the typical washing to drying capacity for a 8kg drum size. A good spin can remove the majority of water from your clothes, which this reduces the amount of drying time you’ll need. Higher spin speeds often to a great job of removing water from your clothes, but not every time. Spin speeds typically go from 1,000rpm to 1,600rpm, and you may have to pay more for a model with a higher spin speed. Faster isn’t always better though - we’ve tested washer-dryers with 1,400rpm spin speeds that do a better job of removing moisture from clothes compared to a model with a 1,600rpm spin. So, before paying extra, see if it’s really worth it by checking out the spin drying star rating in our washer-dryers reviews. Almost all washer-dryers nowadays come with sensor-driven automatic drying programs. This means that the machine sets the drying time based on the humidity in the drum. But our tests have found that some machines are much more accurate at setting how long to dry than others. We've found washer-dryers that over-dry clothes, which could lead to shrinkage and fabrics becoming damaged. Others miscalculate the other way, leaving clothes too wet. When you’re in the shop, you won’t be able to tell how noisy different models are going to be. So, if having a quiet appliance is your key buying concern, look for models that get at least a four-star rating from us. We include a noise star rating for all the washer-dryers we review. The more stars the quieter the machine will be. Washer-dryers are two machines in one so in theory there’s more that can go wrong with them. Choose a washer-dryer from a brand with a good reputation for product reliability and performance. Going for a well-known name won’t guarantee you'll get a reliable washer-dryer that won’t breakdown - particularly where washer-dryers are concerned. Every year we contact thousands of members and get feedback to find out how reliable brands of washer-dryers are. Find our which washer-dryer brands have the best breakdown record with our most reliable washer-dryer brands guide. Almost all washer-dryers use water when drying – they use water to cool the condenser and it's this that turns the steamy air into water, which can be drained away from the machine. 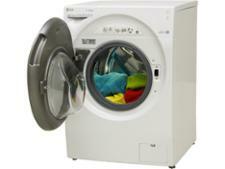 An average sized machine (8kg washing and 5kg drying) will use around 20,000 litres per year in total to wash and dry. 20,000The number of litres of water a typical washer-dryer can use in a year. Use our water use star ratings to find the most water-efficient machine in our washer-dryer reviews. If you’re looking for a black or silver washer-dryer, you shouldn’t have too much trouble. Most brands, including Samsung and Indesit make models in variations of white, black and silver. But if you’re looking for more individual shades like green or blue you will have less choice, will probably have to pay a little more and you might have to opt for a lesser known brand. Try opening it. Does the handle pinch your fingers? Does it open and close easily? On freestanding models, see whether the door can open flat (or nearly flat) against the machine – this will make loading easier. And watch for doors that swing back. If it’s narrower than the length of a piece of A4 paper, look for a model with a wider opening – this will also make loading easier. Do this when you’re standing up, as you would do at home. Make sure you can read everything without having to bend down or strain your eyes. And check that the text and symbol markings seem clear to you. Check for useful features, such as a time-remaining display and child locks to prevent youngsters from changing the program when you’re not looking. Quick-wash programs are becoming more popular and are handy when you’re in a rush. But they are often designed for very small loads, less than 2kg in some instances. Ready to pick your dryer? Go straight to our washer-dryer reviews to get our expert verdict on the latest models.